UN Emergency Relief Coordinator Mark Lowcock briefs the Security Council on the humanitarian situation in Syria. 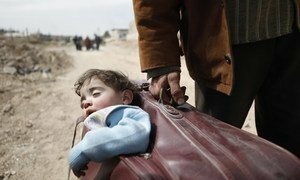 Despite the Security Council’s demand for cessation of hostilities in Syria, civilians in the war-torn country continue to bear the “enormous” cost of intense military activity by parties to the conflict, the top United Nations relief official said Tuesday. Mr. Lowcock also spoke of the situation in Rukban, eastern Ghouta and Idleb. As to Afrin, in north-west Syria, humanitarian actors continue to struggle to gain sustained access to the area, and freedom of movement for internally displaced persons remains severely limited, he said.